“We urge the president of other universities to stand out to safeguard free speech and academic freedom at Hong Kong universities”: joint statement from more than 10 Hong Kong university student unions. 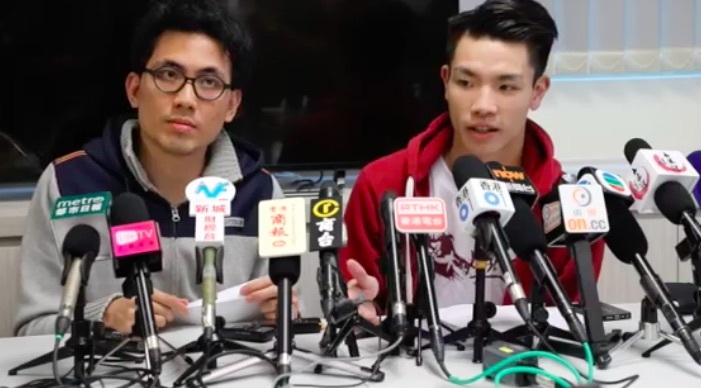 Lau Tsz-kei 刘子颀, the university’s student union president, and Andrew Chan Lok-hang 陈乐行, a fifth-year student at the HKBU School of Chinese Medicine, were barred from classes for violating the HKBU students’ code of conduct. They were involved in an eight-hour standoff at the school’s language center last week, in which they used foul language and appeared to aggressively confront the staff. According to Chin, the decision had nothing to do with politics and was made because teachers at the scene felt threatened and insulted by the students’ behavior. He said that both he and the school were facing immense pressure due to the incident — from whom or what, he did not specify — adding that the ongoing disciplinary proceedings would take a few weeks to complete. At one moment during the announcement, Chin appeared to hold back tears. In response to the decision, Lau and Chan held a press conference that same day. Lau said that he was surprised and enraged by the decision, adding that it’s inappropriate for the university to punish its students without a thorough investigation. He said that he has lost confidence in the the university’s president and viewed the suspension as a warning to the students to not intervene in school politics. Chan expressed regret at attending the school in the first place. 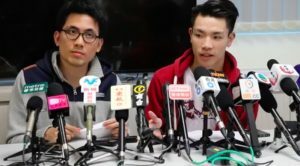 The duo’s resistance has found support with other student groups in Hong Kong, including the student unions of the Chinese University of Hong Kong and Hong Kong University. In a joint statement released on January 24, more than 10 universities’ student unions in the city criticized Chin for infringing on freedom of speech on campus. “We urge the president of other universities to stand out to safeguard free speech and academic freedom at Hong Kong universities,” the statement reads. This series of events was triggered by an incident on January 17, when a group of about 30 students, including Lau and Chan, stormed into the school’s language center and argued with staff members over the university’s mandatory Mandarin language requirement, centered around a new test that allows students the chance to opt-out of Mandarin classes. The confrontation attracted a lot public attention after footage of it circulated online. According to Hong Kong Free Press, students at HKBU have been campaigning against the Mandarin proficiency requirement for a long time. A controversial exam was introduced by the school’s language center in June 2016, in which students who pass the test can be exempted from taking Mandarin classes. The first round of such tests took place last October and November, but the results were not released until last Monday, January 15. It was revealed that 70 percent of those who sat the test had failed. Chan was about to start an internship with a Guangzhou hospital when the video went viral on the Chinese internet. He said he had to give up the opportunity and return to Hong Kong because the hospital had fielded a number of threatening calls against him. The decision to suspend the students elevated the dispute to a new level. On the night of January 24, notices with insulting language directed at president Chin appeared on the campus of the University of Hong Kong, where Chin used to serve as deputy vice-chancellor from 2010 to 2015. The next day, in an attempt to ease tensions, Baptist University officials met with some of the students who took part in the protest and promised to consider all possibilities in reviewing the Mandarin graduation requirement. It does not seem to have worked. Hong Kong Free Press reports that students at HKBU will hold a march and a class boycott tomorrow, on Friday. Two students at Hong Kong Baptist University (HKBU) have been suspended following protests on their campus against a compulsory Mandarin language proficiency test last week, school president Roland Chin Tai-hong 钱大康 announced in a press conference on Wednesday. Posted in Hong Kong, Language, Politics, Uncategorized	Bookmark the permalink.